Customer experience is a key pillar of digital transformation. Nutanix is a leader in hyperconverged systems and the enterprise Cloud platform. Nutanix maintains multiple web portals for customer support, partner support, and the community. One of our top priorities is making the customer experience as simple and seamless as possible. We realized that we needed to create a more seamless sign-on experience for our portals and mobile apps if we wanted to maintain growth. Having a product that is open source, supported multiple security protocols, and can scale was key. This talk will focus on how WSO2 Identity Server checked all those requirements. WSO2Con USA 2017: Enhancing Customer Experience with WSO2 Identity Server from WSO2 Inc.
Manoj is a senior technology leader successful in building high performing teams and leading complex software/web development projects. 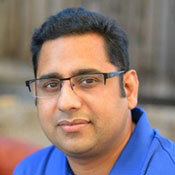 He currently leads the software development of SaaS and engineering tools at Nutanix. He’s responsible for highly scalable full stack development using Node.js, Sails.js, Express.js, Backbone.js and Angular.js. The domains involved include mobile development, RESTful APIs for software upgrades, portal, analytics, Heroku PaaS, Heroku Connect, and identity & access management.